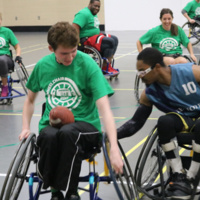 UAB will face off against the Lakeshore Foundation during Homecoming Week in a wheelchair football game in the Campus Recreation Center. Come support the Blazers and enter in to win door prizes and halftime games! This event is free and open to the Birmingham Community! Pizza and cookies are available to all that attend!